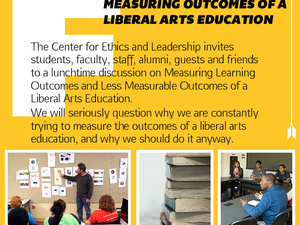 The Center for Ethics and Leadership invites students, faculty, staff, alumni, guests and friends to a lunchtime discussion on Measuring Learning Outcomes and Less Measurable Outcomes of a Liberal Arts Education. Today’s Fusion will seriously question why we are constantly trying to measure the outcomes of a liberal arts education, and why we should do it anyway. Lunch (with vegetarian options) will be provided with a RSVP. Seats go fast! Please register soon. You can find driving directions, campus map, and visitor parking info at https://www.stedwards.edu/contact-us/main-campus-united-states.